This place is a jungle. As a leader, you might never utter those words aloud…but chances are you’ve thought them. 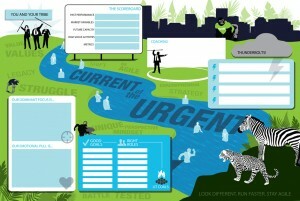 And no wonder: In every office, cubicle, and conference space, there’s a frenzy of activity. Meetings are happening. Questions are being asked. Inboxes are blowing up with urgent emails. Phones are ringing off their hooks. Texts are lighting up smartphones. So why, with all this nonstop activity, isn’t your company moving forward at the pace you’d like it to? And why, despite all of the tasks they perform, do your employees seem more like a herd of unfocused, fractious, and very noisy animals rather than the unified team you’d like them to be? Your employees are so caught up in the chaos of the concrete jungle — the rough, brutal business world where everyone is scraping and clawing to get what’s theirs — that true growth and innovation are being impeded. But don’t give in to the call of the wild just yet. Yes, the inhabitants of your corner of the concrete jungle might be confusing activity with productivity — but the good news is, you can help them adapt. The concrete jungle simply doesn’t yield to the roar of the lion (in other words, a command-and-control leadership model) anymore. Instead, a new breed is evolving: the Zebra and Cheetah (or Z&C) Leader. Zebra and Cheetah Leaders are so called because they exhibit qualities of both breeds. Like zebras, they boast a distinctive appearance that others can easily recognize. Like cheetahs, they possess great speed and are particularly quick accelerators. And like both, they have an ability to utilize their senses so well that they excel in adapting to their environments. In other words, these are leaders who are able to adapt to the fast-paced, always-changing, and highly competitive business world, and who are capable of leading diverse tribes within it. Zebra and Cheetah Leaders recognize that the corporate terrain is filled with those who, unlike themselves, have refused to adapt to the ever-changing landscape of reality. These folks have laid claim to their territories and will fight to defend their way of thinking. They prevent best-practice ideas from getting to decision makers, and they rarely align performances with expectations. They pass blame from one person to the next, to circumstances, or to sheer bad luck. And, of course, these behaviors prevent their organizations from being agile, accountable, and innovative enough to compete in the global economy. The good news is that once you have identified all of the species in your environment, you can take steps to help each one adapt to reality, and you can motivate all of them to work together toward a collectively prized outcome. Much like ostriches in the wild, the type you’re likely to find in your office are known for burying their heads in the sand because they don’t want to acknowledge reality and the challenges they face. You may hear these people say things like, “I choose not to participate in this recession.” And if you listen from around the corner as they chat at the water cooler, you may catch your resident ostriches griping about the negative aspects of the business. Ostriches talk the most at meetings in order to give the appearance that they are doing things, but they rarely add value to the work that must get done or try to advance the organization. What they don’t realize is that simply burying their heads in the sand and waiting for things to blow over won’t change the reality. Ignoring circumstances won’t make them change or go away. How to Tame This Beast: Go First. The fact is, change and challenges — the things that ostriches like to pretend don’t exist—are the only constant in today’s global economy. As a Z&C Leader, you can encourage your ostriches to take their heads out of the sand by courageously implementing changes yourself and looking obstacles squarely in the face. Never ask your people to do something you aren’t willing to tackle yourself! When ostriches see you forging ahead and thriving, they’ll soon forget how opposed to forward progress they used to be. Their shells might not be physical, but the hallmark of a concrete jungle turtle is a desire for comfort without any risk. Problem is, this way of thinking leads people to believe that preserving their own comfort outweighs any risk. And as a result, their motivation has dissipated into thin air. Turtles covet an existence that’s comfortable — not bad, not fantastic, but okay. If circumstances get too uncomfortable for them, they’ll slide back into the comforts of their shells and not engage anyone or anything for any reason. And if you threaten them, they’ll snap at you. In your office, these are the people who accomplish tasks at a painfully slow pace, all the while looking like the weight of the world is on their backs. How to Tame This Beast: Use a Lot of Carrot (and a Little Stick). Turtles are perfectly happy with the status quo. But instead of forcibly changing that status quo, Z&C Leaders coax turtles to change it themselves. Use rewards (for example, bonuses or time off), recognition, and praise to convince turtles that going out on a limb is worth it. And to convince particularly stubborn turtles to enter the race, put penalties in place for lack of progress. Suddenly, the status quo won’t be so comfortable anymore. In the wild, elephants are known for having strong family ties and living in tight family groups called herds. In the concrete jungle, you may think of them as “the old guard.” Though they were once esteemed for the glamor of their prized ivory tusks (i.e., their skills, their expertise, their connections, etc. ), culture and time have made their once-valuable resource(s) dated… or even toxic. Embitterment that they’re no longer living in ‘the good old days’ has caused elephants to develop a thick, calloused hide that makes them impervious to the environment around them. They don’t take too kindly to outsiders. They have long memories and will always side with their herd over people with new ideas. Anger them and they’ll stampede, bringing the entire herd with them against you. How to Tame This Beast: Make Them Your Values Guardian. Elephants are known for their great memories. You have to show your elephants that the institutional knowledge they possess is and will always be valuable. It’s likely that your herd of elephants know your organization’s values and mission better than anyone. In fact, the reason they may be reluctant to go along with ongoing change is because they think the organization is moving away from the values they hold so dear. Instead of letting your elephants stand around flicking their tails as they try to guard the old way of doing things, help them buy in to change by picking their brains on how to ensure upcoming innovations and growth don’t move the company away from its (and their) established values. Cheerful and carefree (some might say careless! ), the monkeys in your office swing from tree to tree looking for the next best idea or opportunity without taking the time to really understand how the opportunity will impact them… or the other animals around them. As the old saying ‘monkey see, monkey do’ implies, they’re pretty good at imitating what they see. But if you dig a little deeper, you’ll find that monkeys have no actual original thoughts, and if you’re not careful, they’ll gladly steal yours and run away with them. Monkeys appear to smile a great deal and seem pretty harmless, but they’re quite ferocious when cornered and threatened. How to Tame This Beast: Start Keeping Score. Create a scoreboard system that allows individuals to clearly determine their progress in relation to performance levels set for or with them (note that monkeys — and other animals — shouldn’t be aggressively competing against each other; only themselves). As was the case with turtles, set up a reward-and-penalty system. Soon, monkeys will find that rash decisions and copycat behaviors don’t propel them high enough to reach the “bananas” they want… and they’ll tap into a hitherto ignored source of motivation. At first, you may feel sorry for alligators because they are threatened by the loss of their habitat. But don’t let those feelings make you any less cautious around them. Alligators are primitive creatures who didn’t develop large brain capacities and who possess few instincts other than sheer aggression, the use of force, really big mouths, and sharp teeth to sink into anyone who invades their turf. We wanted to include the problem of not having a toothbrush for all those teeth, but you probably already learned that from the movie The Waterboy. All lightheartedness aside, though, gators are territorial and don’t like to interact with outsiders. Their bad attitudes make those around them defensive and aggressive, too. How to Tame This Beast: Get Them to Move Up, or Move Them Out. Alligators are essentially low performers. In the past, they were carried along by the momentum of the organization. But Z&C Leaders recognize that there’s no longer any room for dead weight in the corporate jungle. Try to help your low performers by providing them with any training and resources they may be lacking. But if these alligators are unable or unwilling to adapt, it’s your responsibility to make sure they don’t drag your entire organization down to the muddy bottom. Finally, we come to the former king of the jungle. These are people (and even entire organizations) who have been incredibly strong and dominant for very long periods of time. In their heyday, their strength and power allowed them to devour the weak — they were the “poster children” for the command-and-control leadership model. However, evolution has left them behind. In the concrete jungle, the strong no longer take from the weak — the smart take from the strong. But while they may no longer be the royalty of the animal kingdom, lions haven’t moved out of the jungle yet. They are still powerful, and they still roar (think noisy marketing campaigns). How to Tame This Beast: Don’t Let Him Intimidate You. Lions’ roars still frighten not-so-smart animals and tribes, but Z&C Leaders, who have more evolved characteristics, don’t let snarls and bellows faze them. Instead, they listen carefully to the lion’s roar, then use it to analyze that particular competitor’s strengths and weaknesses. Try to exploit the lion’s roar in a way that leads to your organization’s expansion and growth. There’s a reason why Z&C Leaders’ tribes operate with the lowest cost, with the best service, with the most agile management practices, and so on. … And don’t forget the gorilla. Specifically, the 10,000-pound gorilla. He’s known as culture, and he will destroy anything in his path, including all of the great ideas that you and your tribe have. You may not notice your organization’s culture until it becomes negative and begins to emit a stale odor (much like an animal’s nest). When the gorilla takes over, you’ll find that progress has come to a stalemate, employees don’t want to leave the comfort of familiar surroundings, and they certainly don’t want to share their space with anyone. To make matters worse, they actively resist the efforts of those change-brokers who invade the nests (often young and/or progressive-minded employees with positive outlooks and plenty of motivation) and reject their insights. Instead of actively forging ahead to new territories, employees in the grip of the gorilla simply spend all their time telling each other how wonderful they are and heaping empty praise on others, who heap it back upon them in return. How to Tame This Beast: Don’t Feed the Animal. Z&C Leaders who need to tame the culture gorilla must first acknowledge that they’ve been feeding and nourishing it — otherwise, it would never have reached the 10,000-pound mark. You can turn your harmful gorilla-feeding behaviors around by identifying and creating culture cultivators; in other words, individuals who are willing to embrace the challenge of capturing and taming the gorilla by retraining it. Culture cultivators must confront the question of who we are and how we do things and put processes and procedures into place that allow the tribe to do its daily business effectively, even when managers are not around. After reading this field guide to the concrete jungle, you may be wondering how, exactly, you’re supposed to take such a motley crew of creatures and turn them into a unified, agile tribe that works toward a dominant aspiration. Fortunately, all things in the jungle gravitate toward leadership. And once you’re able to identify the residents of your own particular animal kingdom as well as the challenges each one represents, you’ll be well on your way to creating order out of chaos so that your business can move forward.